I power through roughly a novel per week, and I keep track of what I am currently reading on my web site, here. A few months ago I met author Lynne Heinzmann at the Rhode Island Author’s Expo. She gave me a bookmark she had made up for one of her books. And then months later her mother set me up for a reading at the Davisville Free Library in March. I finally got around to reading Lynne’s book, Frozen Voices. 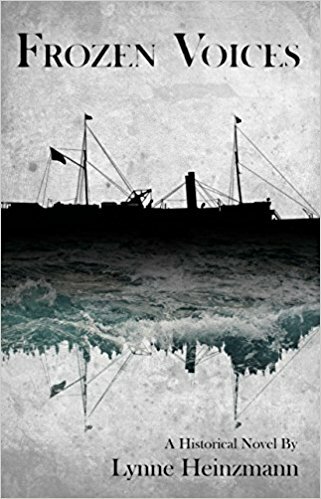 It’s the story of the sinking of the steamship the Larchmont in Block Island Sound, just off the coast of Rhode Island in 1907. Only 19 people aboard the Larchmont survived the wreck, 143 died. Lynne Heinzmann did her homework when she wrote this book. She found actual people aboard the Larchmont, and did the best she could to learn everything she possibly could about them. Then told their stories of their lives as they lead up to being aboard the ship bound from Providence to New York City. Let’s see… she had the stories of Captain McVey, who was the captain of the ship. She had Anna Jensen and her daughter Louise, who were eventually bound for Sweden. Louise had in secret married a man who worked for her parents, and the Jensen’s were picking up the pieces from that. Sadie Golub was a dressmaker bound for a better life and career in NYC. Millard Franklin was a budding magician bound for NYC to join Harry Houdini in his traveling show. Harry Houdini had in fact contacted the Franklin family and offered to pay his funeral expenses. Though she had largely fabricated the events in their lives leading up to them being on the ship, the point is they were all there. And their stories, though historical fiction, are very believable. She did an awesome job with her research that I could picture what it must have been like living in that time and facing the day to day decisions that these real life characters faced. The Larchmonth wreck sits in 120 feet off the coast of Rhode Island. The ship was constructed of wood, and had paddle wheels on the sides. It’s broken up at the bottom of the dark New England ocean. I am not sure if I’ll ever get to dive it… that’s pretty deep, and cold, and dark, and the current is strong there. But the book Frozen Voices is well worth the read. You can grab it here on Amazon.